I LOVE LIGHTHOUSES. I LOVE THEM FROM A DESIGN ASPECT. AND I LOVE THEM IN THEIR METAPHORICAL SENSE - THE ENDURING LIGHT THEY PROVIDE DESPITE EVERYTHING THAT MOTHER NATURE HURLS AT THEM - STOICALLY SHOWING THE WAY THROUGH LIFE'S GREAT STORM. In this third and final episode of our Bahamian Lighthouse Series, we visit Great Inagua Lighthouse through the well-travelled lens of acclaimed Bahamian artist Dede Brown. Built in 1870, the all-white lighthouse marking The Bahamas most southerly island of Inagua, was one of two remaining hand-wound kerosene lighthouses in the world (the last one being Elbow Reef Lighthouse) until recently when she bid farewell to her final lighthouse keeper and joined the common ranks of the automated. Copy of Photos by Dede Brown. Reports suggest that Great Inagua was the first island in the Bahamas to experience piracy in 1713. In subsequent years, many ships were wrecked in the reefs along the island's rocky shoreline, and The English Crown selected the island as a location for a lighthouse to be built in the 1800s to prevent such incidents. The Great Inagua Lighthouse stands 113 ft tall and provides light visibility up to 17 miles. From the top of the lighthouse on a clear day, you can see the entire island, and Cuba to the southwest. Copy of The artist at work. In the olden days lighthouses were primarily used by sea-goers to determine their position at night. This helped immensely with navigation as sailors could determine their whereabouts without having to make landfall. To this day, there is a distinctive light pattern system used by each lighthouses for simple identification - Great Inagua Lighthouse can be identified by two white flashes every 10 seconds. This simple sequence of flashing lights can and does save lives. The Last of The Keepers. Until recent years, Great Inagua Lighthouse had a keeper who was responsible for tending to and caring for the lighthouse. Traditionally, lighthouse keepers trimmed wicks, replenished fuel, wound clocks and conducted regular maintenance checks. Electrification and other automated improvements have all but made this role redundant around the islands. The last of the keepers can be found at the Elbow Reef Lighthouse - the only surviving hand-wound kerosene lighthouse left in the world. 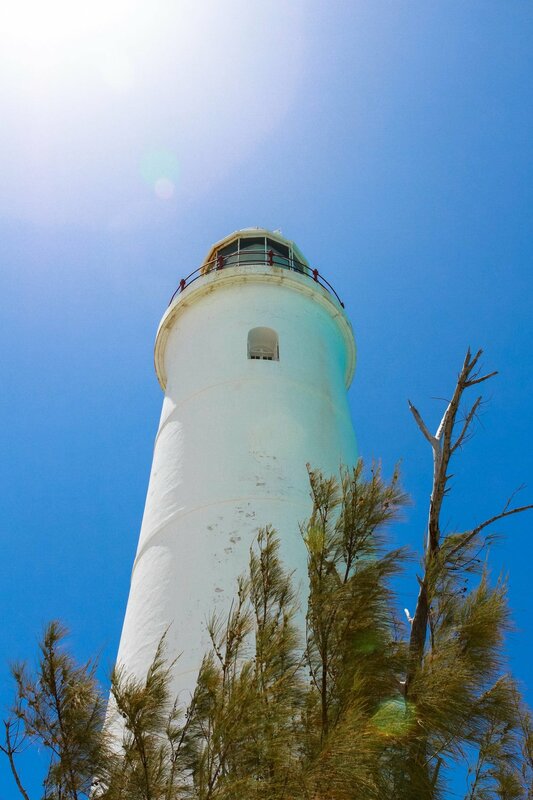 You can read more about our unique lighthouses in our Bahamian Lighthouse Series or by clicking on an image below. At Cacique, we love to tell stories about the characters and places that coloured the rich tapestry of our Bahamian history. For more information on historic experiences with Cacique International or to arrange a tour of one of our remarkable Bahamian lighthouses, please feel free to contact us.